The Atlantic Monthly has praised The Oxford History of the United States as "the most distinguished series in American historical scholarship," a series that "synthesizes a generation's worth of historical inquiry and knowledge into one literally state-of-the-art book. Who touches these books touches a profession." Conceived under the general editorship of one of the leading American historians of our time, C. Vann Woodward, The Oxford History of the United States blends social, political, economic, cultural, diplomatic, and military history into coherent and vividly written narrative. 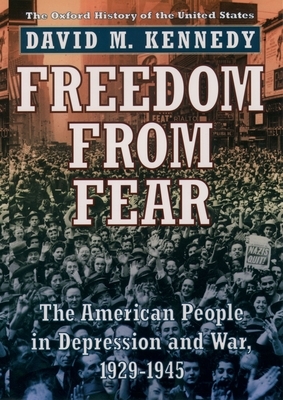 Previous volumes are Robert Middlekauff's The Glorious Cause: The American Revolution; James M. McPherson's Battle Cry of Freedom: The Civil War Era (which won a Pulitzer Prize and was a New York Times Best Seller); and James T. Patterson's Grand Expectations: The United States 1945-1974 (which won a Bancroft Prize). David M. Kennedy is Donald J. McLachlan Professor of History at Stanford University. He is the author of Over Here: The First World War and American Society, which was nominated for a Pulitzer Prize, and Birth Control in America: The Career of Margaret Sanger, which won a Bancroft Prize. He lives in Stanford, California.